DC Comics gets serious in its rivalry with Marvel Studios in this impressively dark and threatening origins show; Batman the Early Years eschews the teen soapy Smallville to import Chris Nolan’s Batman movies and repeat the dark aesthetic of Arrow. Don’t forget your flashlight and moral compass. Beginning with the murder of Bruce Wayne’s parents, Gotham‘s opener is less about the strange introspective child who will grow up to be Batman and all about rookie detective Jim Gordon (the excellent Benjamin McKenzie – The OC, Southland). In a city so corrupt it makes Sin City look like Teletubbies, you can already spot many of Batman’s proto-villains; stalker Catwoman, a child Poison Ivy, the Joker as a failing stand-up, the nerdy Riddler in the forensics lab; best of all is a superbly grotesque physical performance from Robin Taylor (Another Earth) as the Penguin. However we’re starting so far back in the back story, there is no Batman, no super-villains, so what we have is a cop show which promises much but is a re-run of The Wire, The Shield and any number of imitators. The script therefore has that mix of American TV cop show tropes, everyone has guilty secrets and is either absurdly pretty or absurdly caricatured. 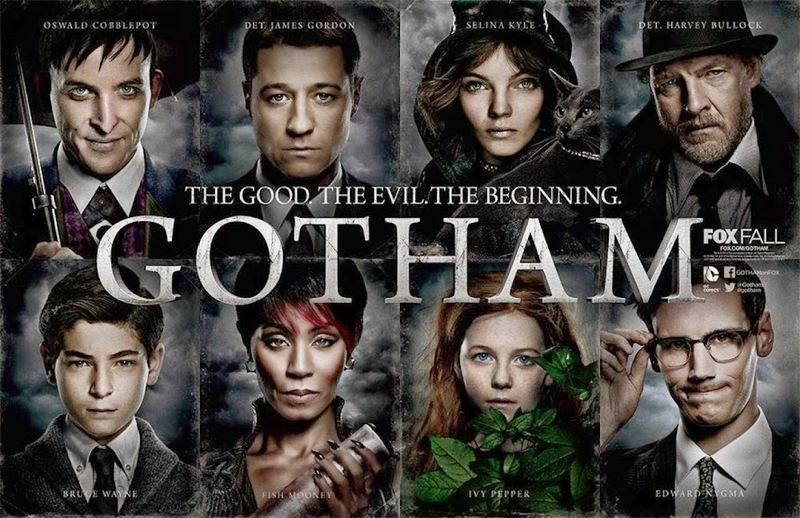 It’s one extreme to the other; Jim Gordon has a model girlfriend (Wales’ Erin Richards) living in a swanky loft apartment, local gangster Fish (glam Jada Pinkett Smith – Matrix) does the Rosario Dawson thing from Sin City; special mention goes to Donal Logue (Life) doing his best Nick Nolte turn as Gordon’s partner, Harvey Bullock. An interesting dynamic emerging is that of the young Bruce (a disturbed and disturbing David Mazouz) with butler Alfred, Britain’s vigorously tough Sean Pertwee (Dog Soldiers, Event Horizon) adding some Shakespearean class. It’s a long haul for a twelve year old Bruce to develop the Bat skills and the toys; and a fine line to walk for six or seven seasons not to get samey, soapey, silly or, without ratings, cancelled. Recall what happened to superhero burn-out Heroes.